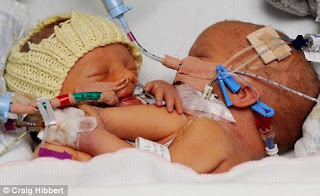 I am sad to report that one of the conjoined twins that was born to Laura and Aled Williams last week has lost her fight after being separated yesterday. Hope Williams died Tuesday night. Her lungs were too small to support her breathing, the lead doctor said. Hope’s sister, Faith is in stable condition, said Professor Agostino Pierro, the head of the surgical team. It was originally hoped the operation to separate the girls could be done when they were older, but Pierro said the children’s health had been deteriorating. More than 20 doctors, nurses and other health professionals were involved in the separation.